Last week, one of my teammates asked me what are the top 3 books that has helped me in my business. Having read hundreds of books over the years, this was a tough question to answer. After some thought, I finally trimmed down my selection to just 3 (plus 1 more bonus book). 🙂 These 3 books have helped me fully-transition from my 9-year IT career to establishing a 5-year old international business in 5 countries. Here’s a short 5-minute video of me sharing my top 3 books that has helped me in my business and why. For those who have slow internet connection and cannot watch the video, I have listed them down here for your convenience and added more insights as well. This is turning out to be one of the classics in business books. I’ve read this sometime in 2003 or 2004 while browsing in a bookstore. It opened my eyes to the value of going into business. 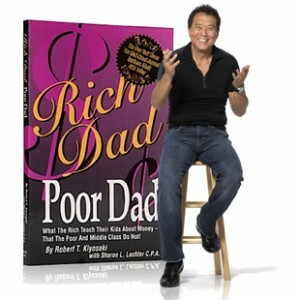 Prior to reading this book, I thought the only way to earn money was by having a job. It took me sometime, and several tries until I was finally able to quit my 9-year IT career and fully transition into business in the last 5 years. Without this book, I believe I would still be stuck in a job that I no longer enjoy, felt restricted by the office rules and politics and limited growth income potential. This is one of my favorite books of all time. After quitting my job, I realized there are still a lot of things that I needed to change to become a full-pledged entrepreneur. Nine years of working for a job has stilled in me a lot of habits and mindset that are not helpful in building a business. I realized after reading this book that I will have to change my mindset. I would have to add on to the existing core values in order to thrive. I will have to find out why FREEDOM is more important than SECURITY. When you become an entrepreneur, your RESULTS will dictate how effective you are. It’s not how many hours you spent doing something, it’s the VALUE you create on those hours that’s more important. I realized later on that the SHIFT that needs to happen is more than changing from job to job. You have to change your CORE habits and values. Only then will you understand how to think differently, and get your behaviours and actions change to achieve the results you like. This is a book I bought around a year ago. It is a story of the owner of Amway. He is a legend in the direct selling industry having built one of the most recognizable brands, and becoming a Billionaire in US dollars in the process. He now owns one of the NBA teams, Orlando Magic, and lives an exciting lifestyle described in the book. While reading through it, I realized there’s so much potential going into business. Something that starts small can grow into something big; so big even your wildest imagination could not have predicted how it would turn out. When I look back, one thing I had going for me was my DEEP HUNGER to LEARN. I knew how to work hard. But I realized working hard is only half of the equation. You also need to know what you need to work hard on. After reading countless books on motivation, mindset and more, I knew that to get to a higher income means you need to become more valuable. You can become more valuable if you can help other people solve their problems. How can you better solve their problems? Have BETTER skills! For certain professions like that of a surgeon, the skill you need to learn is how to operate on a human being. Obviously, not everyone can do it. It is a valuable skill to learn. You would have to invest a lot of time and money to become a surgeon. That’s why people are willing to pay a HUGE amount of money for it. Compare that to someone who flips burgers. Flipping burgers is a skill that most people can learn in a few minutes. They invested little money and a few minutes of their time. That’s why the pay isn’t so great for a man flipping burger. Today, with the advent of technology, one can deliver value by leveraging technology. Anyone ambitious who is open to opportunities and willing to invest time and effort to build a system and create tremendous value can become rich. The potential for growth is HUGE! Ordinary people like us have more venues to give value to more people. Unfortunately for people who cling to job security, they will be in for a great surprise. Job security doesn’t exist anymore. Some financial analysts even say that another financial crash is about to happen (or already happening). The stock market is shaky. Some of the biggest oil companies in the world are cutting jobs because of the price going down. China is facing financial difficulties as well. The world is changing. So we must change as well. These 3 books have changed me and I am very grateful to have made my decision to change 5 years ago. I hope they will also help you muster the same courage to make the necessary changes to improve your life. There’s help at the other end once you decide to change. As Jim Roh said, "Your life doesn’t get better by chance. It gets better by CHANGE."